Description: Pastor Bill Scheer, senior pastor of GUTS church in Tulsa, Oklahoma, shares from Scripture what God said about healing in 15 easy readings along with declarations of faith for readers to receive God's healing power. 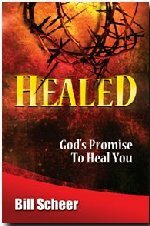 This powerful little book is full of God's Word on healing. Bill Scheer's straightforward and innovative teaching will inspire readers to take hold of God's healing power for their life. Each reading reveals a new aspect of God's plan for healing including God's Grace, God's Blessing, God's Redemption, God's Medicine, and more. Complete with examples of His power in the Scriptures, readers are encouraged to pray and declare their faith at the end of each reading. This is a great resource for pastors, churches, and individuals for hospital ministry, group ministry, and personal encouragement.